Does your skin ever become red and sore under the wafer of your ostomy appliance? Sore, irritated skin is not only uncomfortable it also reduces the wear time of the pouching system and contributes to an increased number of pouch changes. When the skin is raw it constantly secretes small amounts of fluid that can cause the pouch to loosen from the skin. Luckily the back of the wafers can absorb small amounts of fluid and can usually compensate for the small amount of moisture and absorb it. Unfortunately, many times the new skin that grows in that closes the raw area can get lifted away with the wafer removal and it opens the area back up again. 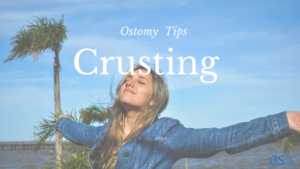 The crusting procedure is a way to create a temporary crust over the open area that can absorb the small amount of moisture and protect the new fragile skin from being lifted away with the next pouch change. By creating a crust over the raw area the crust will be lifted away with the wafer and the new skin is protected. The supplies needed for crusting are simple; ostomy powder and skin barrier (wipe or spray.) An anti-fungal powder can be substituted for the stoma powder if yeast/fungal infection is present. Gently clean surrounding area and pat dry. Apply a thin layer stoma powder to a raw area and allow the powder to be absorbed into the moist area. Use an alcohol-free skin barrier wipe and dab the area to coat powder with a protective layer. Repeat process once or twice again applying powder then skin barrier wipe. End the process with the barrier wipe and apply pouching system on top of the new-formed crust. Barrier spray may be used in place of the wipe. Hopefully, after a couple appliance changes, there will be a noticeable difference in the skin. The crusting procedure is used to treat irritated skin and is not a protective intervention. Once the skin is healed, the crusting procedure should be stopped. If irritation persists seek guidance from local ostomy clinician for skin assessment and appliance evaluation.